Living room area rugs can be the best or the worst asset of your living room. Find out how to pick the right rug for your living room - at a perfect price. (to make living room rugs fit perfectly into your space). ♦ how to get good rugs on the cheap. Pattern = visual clutter. (I know I'm harping on about this but it's super important :-) The larger a design and the higher the dark/light contrast, the greater the visual 'clutter effect' usually is. (You can see an example in this article, too). ♦ 'real' pattern, e.g. on upholstery/cushions/curtains. Geometric vs. naturalistic: In general, geometric patterns integrate more easily into most rooms than, say, florals. Large designs are attention-grabbers. Whether geometric, natural or abstract, a rug with a large-scale design is basically the biggest picture in the room. So if you want to focus attention elsewhere, e.g. on a fine painting or a collection of artisan pottery, choose simplified, unconspicuous, or small-scale rug patterns. Sharon, for example, is planning to hang a large number of black-and-white photos on that sofa wall. This means a considerable amount of visual clutter, even though the color scheme is as reduced as it can possibly be. Sharon's easiest choice would be to go for a solid color area rug. Alternatively, she could look for simple, striped area rugs that fit the bill. Black-and-white living room with a large striped area rug. Black-and-white living room with a part-striped area rug in grey and white. Black-and-white living room with a large area rug in grey, black and white. Now the design looks more interesting, but with the added 'interest' comes distraction from other things in the room, and an added busyness in the overall impression. Black-and-white living room with an 'oversized' rug design. Now if you read on you'll see the rug design that Sharon ended up choosing ... and it looks nothing like any of the above! Many carpet dealers will be happy to cut bulk stock into custom size area rugs for you and finish them with a beautiful border of your choice. 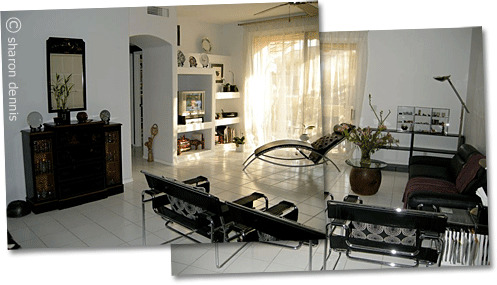 And not just that: You may be able to have your living room area rugs cut in any shape you want! Triangular? Easy peasy. Trapezoid? Why not. Cloud-shaped? If they can do it, they probably will. This way, some of the most luxurious high-pile carpets with a gorgeous 'artisan' look & feel can be turned into perfectly shaped, custom size area rugs, at much lower cost than if you bought a readymade rug. I was at my friends' home for an international club brunch and I said: I love your rugs - I can't afford one right now but at some point I would like an Oriental for my house. I told Annette that I had redecorated and everything was in purples, navy and white and I had never seen Oriental rugs with any purple or violet color. She said: come with me to the garage. There it stood - an 8 by 10 rug. All I could see at the time was the violet/plum border. The men rolled it up for me and I brought it home, and the next day my photo assistant came by to remove it from my car and shake it out - lots of dust - and bring it into the house. The central portion had grape leaves, and green is not my favorite color, but immediately even I who might have been prejudiced against this rug when I first saw it realized that that green made all of the plants in my house absolutely pop! So I bought the rug from my friend Annette for $50. (She then donated $50 to the Wounded Warriors Foundation.) Sadly her house was flooded a year ago and she lost her entire collection of about 15 or 20 rugs so my rug is an orphan - the rescue rug!! Return from Living Room Area Rugs to Living Room Decorating Ideas.